Researchers have used genes from a virus that periodically devastates cassava crops in Africa to create cassava plants that can resist the virus. The finding could save African farmers large economic losses. 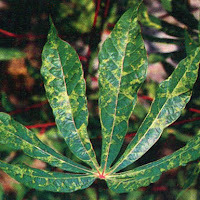 African cassava mosaic virus is transmitted to cassava by whiteflies when they feed on the plant. In parts of East and Central Africa, epidemics of the disease can lead to total losses of harvests. So far, the only way to fight the virus is by using massive doses of insecticide to kill whiteflies. But this can be prohibitively expensive for subsistence farmers and can threaten their health and that of surrounding plants and animals. Now, Peng Zhang and colleagues at the Swiss Federal Institute of Technology in Zurich have used the virus's own genetic material as a weapon against it. Three genes are essential for the virus to replicate. Each of these carries the code for a piece of RNA, a kind of genetic material similar to DNA. RNA can be inactivated when a matching strand binds to it. Knowing the structure of the gene that makes the RNA allows researchers to create matching genes. This is exactly what Zhang's team did. They created 'matching' genes for the three crucial strands of RNA and inserted these into cassava plants. They expected that whenever the modified cassava cells were infected by the virus, the RNA made by the inserted genes would find and stick to the viral RNA, inactivating it and preventing the virus from replicating. In tests, when the plants were exposed to small amounts of the virus, the researchers could see no signs of disease, suggesting their theory was verified. With higher doses of the virus, symptoms were reduced. Zhang told SciDev.Net that although the modified cassava plants were much more resistant to the virus, experiments under natural conditions were needed to confirm the method's effectiveness. His research group plans to work with others in Kenya, Nigeria, the United Kingdom and United States to conduct these experiments.